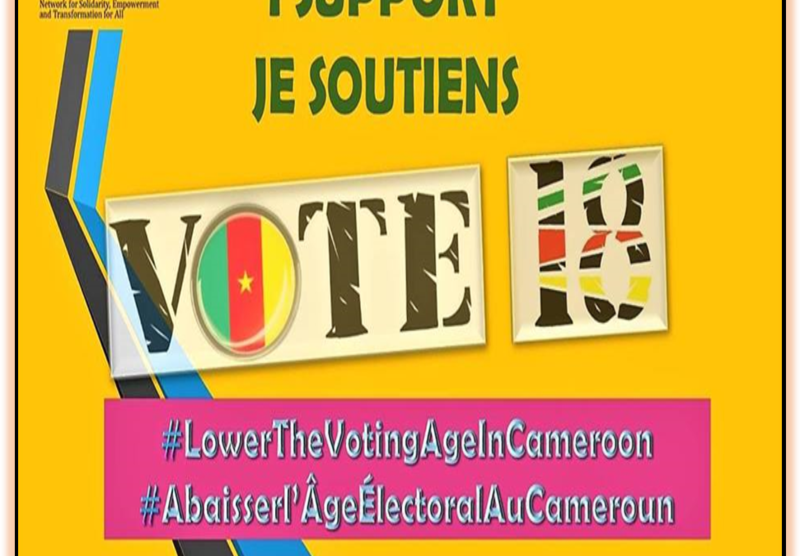 The VOTE 18 Campaign is initiated by the Network for Solidarity, Empowerment and Transformation for All (NewSETA) – a youth organization striving to achieve greater political participation and self empowerment for young people in Cameroon. Through the ‘VOTE 18’ campaign we are advocating the reduction of the minimum voting age from 20 to 18 years, and would hopefully carry out a massive mobilization drive among the new voter category to encourage registration on the electoral rolls and their participation in the forthcoming elections of 2018 and all other elections. This idea to ask for the reduction of the minimum voting age in Cameroon came up after we observed the simultaneous Municipal and Legislative Elections of September 30, 2013. Cameroon’s population then was well over 20 million people. However, only about 5.5 million people registered to vote in these elections. After the elections, evaluations revealed there were about 1.2 million abstentions and 185000 null ballots, meaning those who effectively voted in these elections were slightly just over 4 million. Turnout in an election is often seen as an indicator of the health of any democracy. The turnout in these elections indicated a decreasing interest on the part of the population in the political process. Youths who make up for about 60 % of the population also didn’t show up massively at the polls. So many factors could account for this. We think one of them is the disengagement of young people from the political experience upfront, through restrictive legal provisions. With the exception of Gabon, Cote d’Ivoire and Cameroon, all other African countries have the voting age at 18. As voting doesn’t just occur when once one attains the voting age, we seek to encourage earlier insertion so as to strengthen and sustain the participation of young people in our political process.